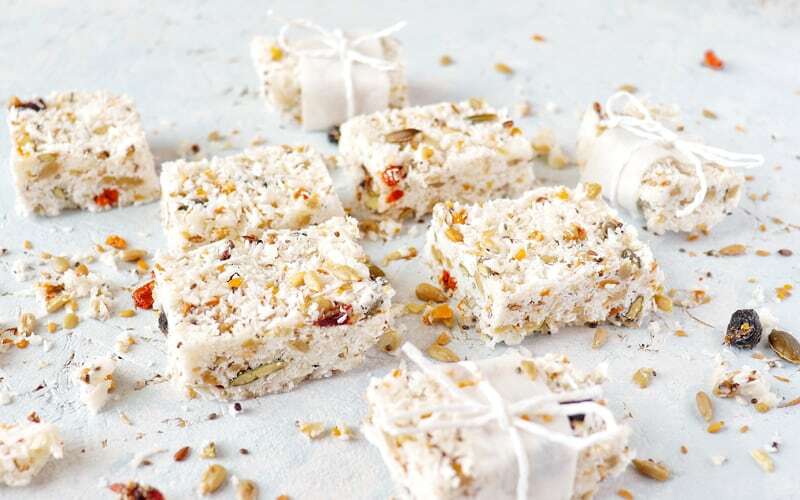 These no-bake delicious coconut and super berry bliss bars are super easy to make and great for kids pack lunches, on-the-go snacking for commuters, or just great for a simple guilt-free treat. Line a small loaf tin or similar mould with grease proof paper. Melt the coconut oil on a low heat in a saucepan. Stir in the vanilla extract, honey, coconut and Super Berry Munchy Seeds and combine well together. Press into the mould and freeze for 30 minutes before cutting up. Store in the fridge. Recipe and photography credit to the Wholefood Warrior.